Competitive pay and fair treatment are key to attracting, engaging, and retaining quality staff, according to a new survey of 540 full-time employees. Companies should offer competitive pay to keep employees engaged. For companies that cannot afford that, though, other opportunities can suffice. 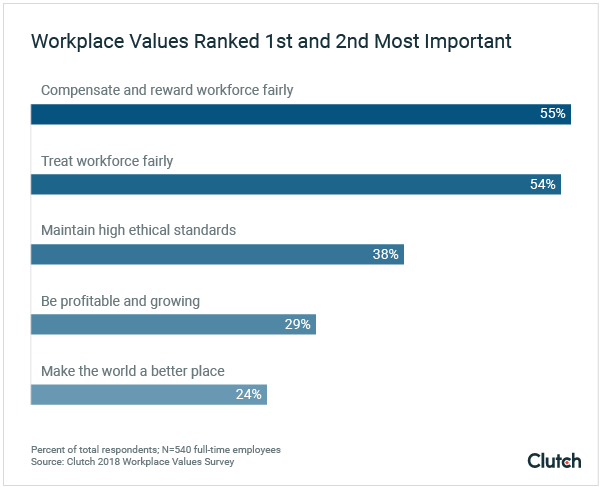 The second most important workplace attribute is that the employer “treats its workforce fairly,” with 54% of employees ranking it as the 1st or 2nd most important attribute. “High ethical standards” ranked 3rd, at 38%. Fairness and ethical standards help an employee feel proud of their work. This is important as work becomes a larger part of employees’ lives. “Work is, more than ever, embedded in our identity as individuals and we want to take pride in our jobs and in our workplaces,” said Patsy Doerr, Global Head of D&I at Thomson Reuters. Companies can promote fairness by offering support to employees that start out at a disadvantage and providing compensation based on skill and work, not privilege. Years ago, employees may not have considered the ethics as important to their choice of employer. This has changed. “With a rising awareness of the need for equality now, more than ever before, employees are looking to ensure their workplace is meeting their corporate citizenship and ethical standards,” said Nate Masterson, CEO of Maple Holistics, a bath and beauty company. For questions about the survey or a comment on the findings, contact Michelle Delgado at [email protected].